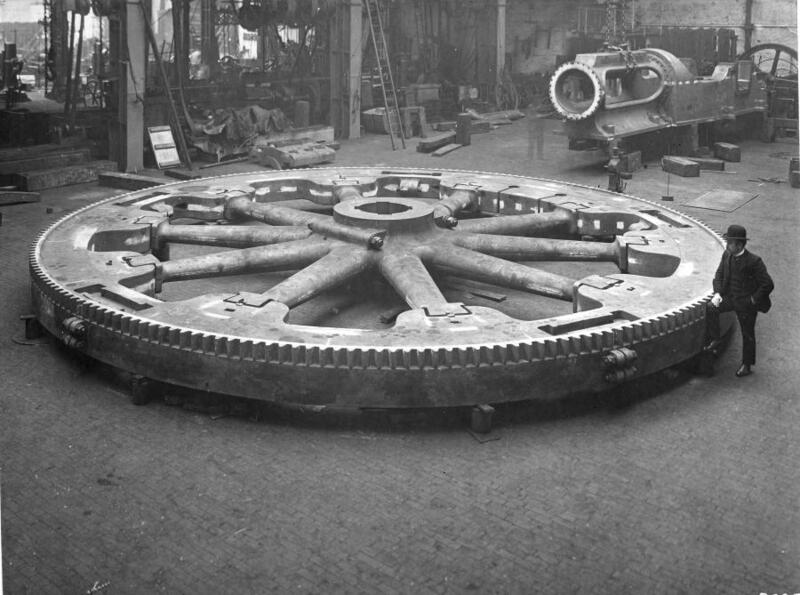 This is a particularly interesting photograph, and it is highly likely that this may be the flywheel for the large rolling mill engine seen in the upper photograph. The gear teeth around the rim of the flywheel are for engaging the "barring engine" for turning the engine over at slow speed when "warming through", and during periods of maintenance such as setting the engines slide valves. This wheel is built up in five sections, being bolted together by sets of two bolts in brackets cast around the outer edge of its rim. The large recesses around the side edge of the rim are where steel keys would be a shrink fit to further bind the wheel together. Beyond the wheel may be seen two bearing keeps, and to the right hand top corner of the photograph the trunk guide and bedplate of the engine under manufacture can be seen, with the "ghost" of a fitter standing beside it, beyond this bedplate there is the flywheel and connecting rod of a small horizontal steam engine,possibly for driving the machine tools in the works by countershafts and belts. there appears to be a hydraulic jack beside the edge of the wheel. The gentleman standing beside the flwheel may be the works manager, one wonders how long he had to remain frozen in this position untill the shot was complete, these photographs may have been taken during a Saturday afternoon when the works was closed for the weekend.